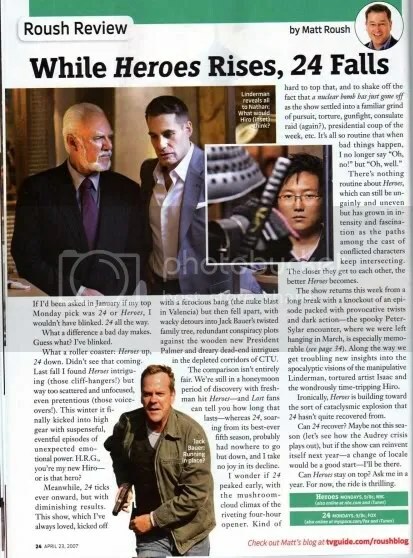 Tim Kring had an exclusive interview with TV Guide discussing the Generations Finale (Powerless). 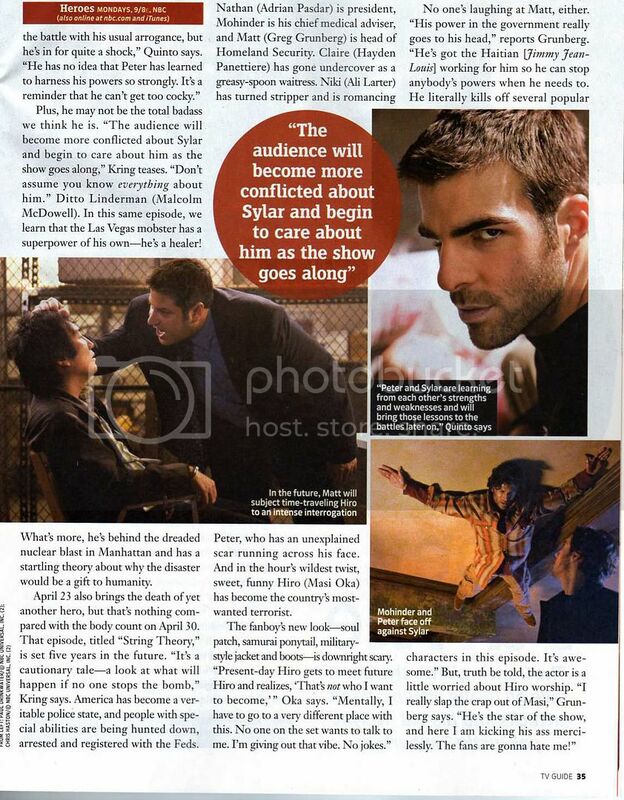 Kring says that the fates of Niki and Nathan have not been decided and are up in the air, while Sylar (Zachary Quinto) will now return for Volume 3. Initially Quinto was supposed to miss most of the Vol. 3 production because of his role in the new JJ Abrams Star Trek, but the writer’s strike delaying Vol. 3 allowed for the re-write to have Sylar return earlier than expected. Additionally, Kring mentions that Vol. 3 will have a “legion” of villains that will possibly join forces against the Heroes. Witchy, bitchy Elle, who wound up saving the lives of Mohinder (Sendhil Ramamurthy), Maya (Dania Ramirez) and little Molly (Adair Tishler), clearly sparked when Mohinder called her a hero. “Kristen Bell gave us the perfect reaction in that scene,” Kring says. “For a moment there, Elle sees she’s been given an opportunity to use her powers in a good way. And she absolutely likes the sound of that word ‘hero. '” Not to worry. There are plenty more baddies coming after the writers’ strike concludes. In fact, the title of Volume 3 — “Villains” — says it all. “Sylar getting his power back does not bode well for our heroes,” says Kring, who admits there is one upside to the writers’ strike: Originally, Quinto was not going to be available for much of Volume 3 because of his commitment to the new Star Trek film. Now, with the strike dragging on, he’ll likely be done playing young Spock by the time Heroes returns to production. 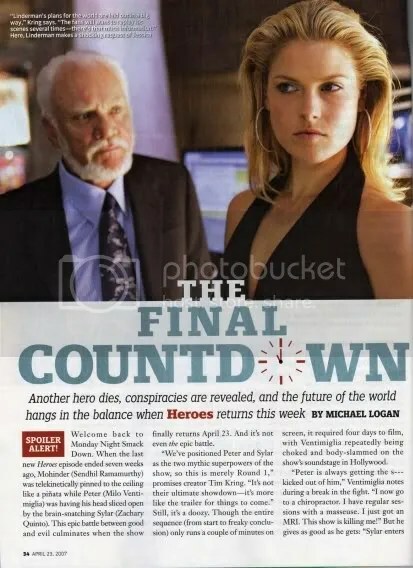 Heroes’ second season may be coming to a close a lot sooner than expected due to the forthcoming apocalypse, also known in some circles as the damn writers’ strike. Sources confirm that the show is going back and shooting an alternate ending to the Dec. 3 episode that, if used, would allow the episode to function as a season finale in the event of a strike. Originally, the episode was only supposed to serve as the conclusion of the current “Generations” arc. Should an 11th-hour agreement be reached and a strike averted (fingers crossed! ), the alt ending would likely be scrapped. Ausiello: She certainly does. And it’s very similar to a power possessed by another hero, only in her case, it takes a lot less effort to get from Point A to Point B.